Landscape plants are the primary focus of our business, and our selection of new and unusual varieties is second to none! Do we also offer the "old standby varieties?" Only the good ones! We grow many of the plants we sell and have been doing this for over 35 years, so we have been able to observe how each plant performs in our NW Indiana climate. 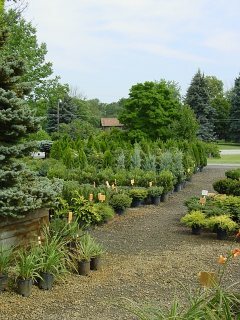 We carry many varieties, shapes and sizes of shrubs. Please come in to see our current selection. 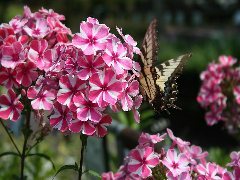 Our perennials are some of the best in Northwest Indiana. Our selection changes throughout the seasons, so come in to see what we have in stock. We carry Bulk Mulch and Top Soil, Sod, weed control, fertilizers (many organic and safe for your kids and pets), and organic animal and pest control. Soil testing is available and we can expertly advise you on what you need to ensure your plants grow. Our Garden Center has specialty "must have" stainless-steel garden tools, ergonomic enhancements, free instructions and top-notch advice. See our unique gifts for Mother's Day, Father's Day, Birthdays, and any occasion. Our unique birdhouses are handmade, and we offer personally engraved garden and yard monuments, stones, markers, and hand-made lawn furniture. This is only a sampling of what we have to offer. Come in to our Garden Center to see much more.